The author is an Assistant City Procecutor of the City of Manila, and the trial prosecutor of RTC Branch 5. 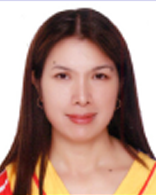 She is also a Commercial Law professor and bar reviewer since 2003 at San Sebastian College Recoletos-Manila and Polytechnic University of the Philippines. A proud graduate of San Sebastian College, she was awarded as outstanding alumnus in 2013, and outstanding prosecutor for the first semester of 2015 in the Office of the City Prosecutor of Manila.